Hail is frozen r ain produced by comulonimbi clouds, typically within 2 miles of the parent storm. Water pellets get picked up by a strong upward motion of air and is reinserted at higher elevations where they freeze again. As density and weight are increased, more and more layers of water freeze on the outside of each stone. Eventually, depending on the upward drafts and wind speeds, these hail stones eventually fall from the sky. When they do so, they may be any where from “pea” or “gravel” sized to as large as 4.5 inches during extreme weather events. Hail can cause significant impact to most things including agriculture and livestock as well as building components. 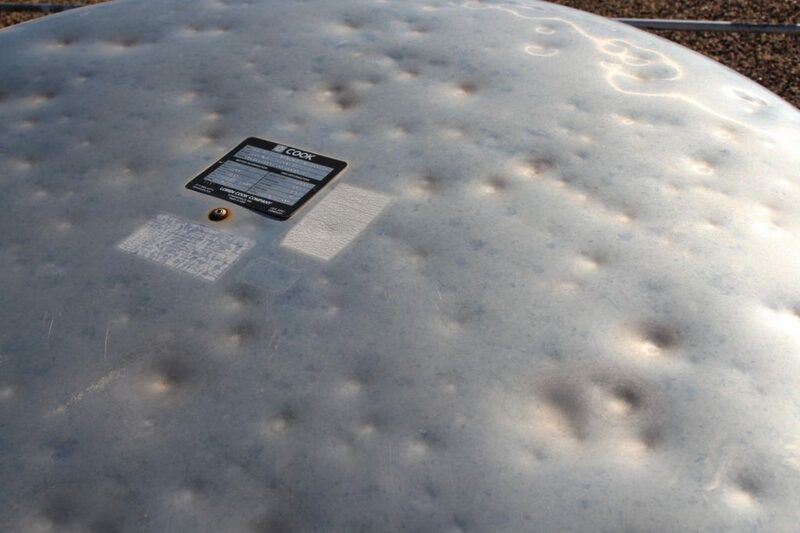 Hail can, and does, destroy hundreds of millions of dollars of farmland every year. In addition to these losses, single hailstorms can cause 500 to even as much as a billion dollars worth of damage, depending on the size of the storm and the area impacted. In recent years various organizations like the IIBHS and Underwriters’ Laboratory have begun to establish criteria for building products rated for hail exposure. These standards are a helpful tool in understanding what damage to expect depending on a typical hailstorm. The science of establishing expected damages based on hail size still has much room for further understanding, including hail speed, density, shape. In addition to special characteristics of the stones there are challenges associated with testing in a lab as compared to testing in the field. Typically, lab testing is completed in the field of a roof installation without modifiers including bridging of roofing materials, overlap of roofing materials, and different insulation materials under flat roofs. The more flex in a membrane, the more likely a tear, perforation, or bruising is to occur that will result in water intrusion. 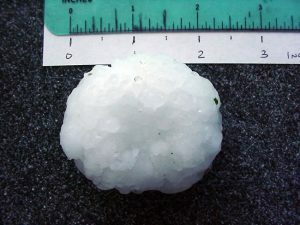 Hail can often be seen in soft metals on rooftops, including HVAC cabinets and coils, roof vents, flashings, and parapet caps. In addition, hail will typically affect elevations of a building. These damages may appear on exterior wall cloutings, including metal, vinyl, EIFS, and even in some occasions, masonry. Other components of exteriors can become damaged including windows, doors, skylights, fencing, and installed lighting and audio/video equipment. In most occasions one can see the path of the storm plus the trajectory, size, and clusters of stones by the signature of damages. Kinetic energy of a storm’s influence on a particular site can be studied based on meteorological data applied to the site’s specific location. The study of hail and its effects on buildings is a complex challenge that is combination of meteorological data collection, engineering, and on-site inspection. Roof vents damaged by hail at Amarillo High School. Photo by Complete.